This Walmart cashier's sweet gift to a struggling mom will restore your faith in humanity. Raising a family is hard enough on its own, but it's especially tough when you're tight on money. Life got a tiny bit easier for one family in South Carolina over the weekend when they were blessed with the kindness of a cashier at their local Walmart. 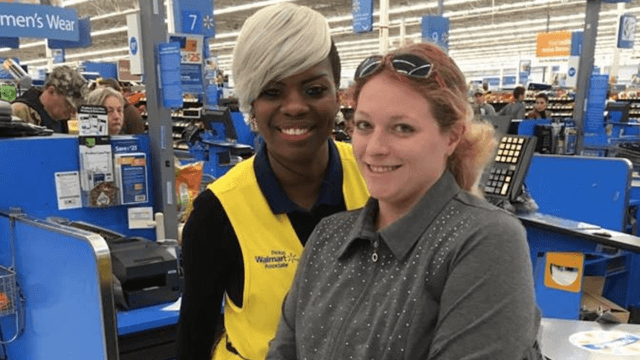 A mom named Ashley Jordan posted a story to Facebook of a kind-hearted Walmart employee named Sharnique, who helped her and her husband pay for groceries for their family of five. Today me and my Husband Michael Jordan went to the Walmart on Garners Ferry Road in Columbia, SC. It was another dreaded shopping trip trying to buy groceries for a family of 5. We got as much stuff as we could get on my husband's income since I'm a Stay at Home Mom. We literally dread going to Walmart and buying groceries period because my husband's whole check goes to food for our family. I will say that I'm not a fan of shopping at Walmart because of how rude some of the people can be. But after tonight my whole perspective has changed. As me and my husband were in line putting our groceries on the thing for the cashier to scan we had our youngest daughter with us. Who was very fussy and tired and just wanted to go to sleep. Half of the time the cashier's don't engage in conversation but the cashier we had tonight was very friendly. I can't remember exactly what she said but it was along the lines of you must have a big family y'all have a lot of stuff. I said yeah we do. She told me my total and I was digging through my wallet trying to count all of my money out. She gave me a smile and said you guys look like you need a blessing tonight. I just smiled back. Then the cashier walked around the counter and was hitting something on the keypad. ( I thought she was giving us a coupon) then she walked back to her register. I then looked at the total and I was at a loss for words. This sweet woman whom I never met in my life paid for half of my groceries! I was in complete shock because I never expected anything like that to ever happen. Me and my husband were just staring at each other like is she serious? Did she really just do this? I was really at a loss for words. I didn't know what to say. How could this woman who didn't even know me, know our situation, know us, why would she do this? I asked her what her name was and she told me , I thanked her and asked her if I could take a picture with her and post it to social media and she said yes. Me and my husband and our very fussy one year old finally got into the car and when we did we just looked at each other and smiled and at that moment we both knew things were going to be OK because there truly are good people out there. Thank you so much Sharnique Dasant you truly are a blessing and you will never realize how much you helped us out and how much faith you have put back into our hearts. Sharnique rocks. Hey, guys. If you have the capacity to help out a stranger this week, do it. Okay? You'll make their day and it'll be awesome. Cool? Good talk.